He simply stopped breathing. As I held his hand, this wonderful man, my father, took his last breath, lying in our guest room on a hospital bed provided by a hospice. "Bye, Dad," I whispered. "I'll miss you so much. Oh, how I'll miss you!" Through tears, I leaned over the bedrail and kissed his forehead. It was over. Dad had lost his hard-fought battle with cancer. Two years earlier my husband, Dan, and I had invited my parents to come live with us. Of course, we knew my parents cherished their independence; we respected that. And we understood their fierce determination never to become a burden to us. Yet, after many long-distance trips, the reality that Mom and Dad needed assistance had become obvious. On several visits we had filled their empty cupboards and refrigerator with groceries, knowing that Dad's medical expenses exceeded his pension. We tucked money into their wallets, paid for prescriptions, left rolls of quarters for their laundry and purchased essentials for them. But my parents' financial shortfalls represented only part of their needs. In their early 80s, Mom and Dad were feeling their age as they tried to cope with his chemotherapy, radiation and trips to the doctor. As Dad's body weakened, Mom tried to help him navigate daily chores, but it was more than she could handle. Her body language told us volumes — total exhaustion, general confusion, unspoken fears. Finally, Mom and Dad agreed to accept our invitation. They moved in with us, and we assisted in Dad's medical care. The commandment to honor our parents (Ephesians 6:2) is not only a lifelong responsibility, but also a privilege. Helping Dad in his final year and a half was rewarding and difficult, joyous and painful, fulfilling and emotionally heartrending. Of special richness to me were my bedside talks with Dad. I took copious notes as he reminisced about his childhood, early marriage and ministry years. Today Mom is 89 and still lives in our home. We face new challenges as the years pass. There may come a day when we cannot give Mom the physical care she needs. She may require assisted or skilled care. God's Word tells us to honor our fathers and mothers. The apostle Paul warns that if we do not care for our own, we're worse than unbelievers (1 Timothy 5:8). But when parents come to live with adult children, both parties relinquish independence, privacy and, sometimes, personal desires. When a parent can't be left alone, often work, travel and vacations have to adjust to accommodate new needs. Though it might not be feasible (or even best) for all families to bring parents into their homes, it is our God-given responsibility to see that they are well cared for and protected. Caring for aging parents costs money. It requires a commitment of time and energy; and it infringes upon freedom and schedules. The emotional pain of watching parents decline can be heartbreaking. Yet the inner joys of blessing the ones who gave us life far outweigh any inconvenience or hardship. Whether your parents live nearby or 2,000 miles away, you can help them enjoy their final years with dignity. Communicate with them regularly. Gather information from local, state or federal elder-care organizations. Prepare a list of nearby friends and family who can help. Scheduling a family pow-wow can be of great value in assuring them that you truly care and wish to honor their wishes. During your family meeting, be gentle and compassionate yet firm. Ask probing, specific questions such as, "Dad, I see all your medication bottles are empty. Would it be helpful to have them delivered to your home?" or "Mom, I'm worried that you seem to be increasingly unsteady on your feet. How can we help protect you from falls?" As much as possible, allow your parents to make their own decisions — as long as they do not endanger themselves or others. Acquiring legal documents is also important. When my father became ill, both Mom and Dad signed papers giving me power of attorney to make decisions for them. Now, nine years later, this is invaluable as I care for Mom's finances, health issues and legal matters. The commandment to honor our parents (Ephesians 6:2) is not only a lifelong responsibility, but also a privilege. As young children, we showed honor to our parents through obedience. 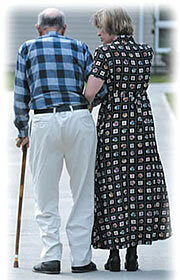 In later years, we can demonstrate honor by seeing that our aging mothers and fathers receive excellent, loving care. Taken from Focus on the Family magazine, September 2007. Article copyright © 2007, Karilee Hayden.